The Las Vegas metropolitan area is home to over 2 million people, but the city attracts many more millions of visitors each and every year due to its unique attractions and distinctive hotels and casinos. There’s so much to do in Vegas, so it’s no surprise that many people go back time and time again with friends and families. The city’s hotels are simply magical, with each one featuring its own unique design like a fairy tale castle or an ancient Egyptian pyramid. Vegas’ casinos are equally thrilling, stuffed with countless games and machines that give you a chance to win big. And even if you’re not interested in those activities, the city still has a lot more to offer like live shows and outdoor fun. However, one of the things everyone needs to consider before visiting Las Vegas is the weather. Vegas’ weather is very similar to weather around the rest of the great state of Nevada. This means that conditions are generally very dry, with relatively low wind speeds and humidity ratings, and barely any rainfall at all. Temperatures tend to be quite high compared to other major United States’ cities, but it’s important to note that even though Las Vegas is located in a desert location, its weather isn’t always the same. Temperatures and chances of rainfall can vary in the city quite widely, so let’s take a closer look at Las Vegas weather conditions in October. October is right in the middle of the fall season, meaning that temperatures have officially started to drop in preparation the end of the year and the arrival of winter. The warmth of summer has departed, but some cities, like Las Vegas, still enjoy quite high temperatures at this time of year. The average daily temperature in Vegas during October is 70 °F (21 °C), with highs reaching up to 82 °F (28 °C) and lows dropping down to around 54 °F (12 °C) on average. This means that a typical October day in Sin City can be quite mild and even warm in some cases. 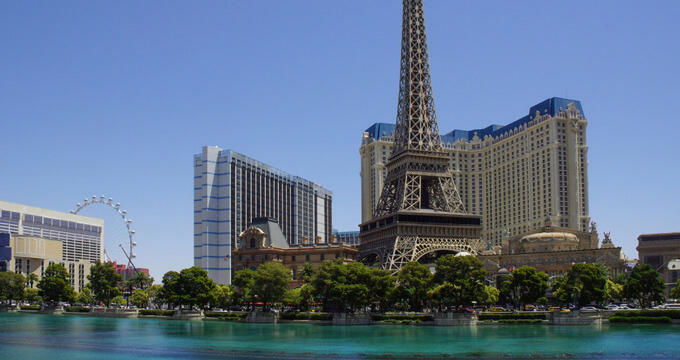 Las Vegas is situated in Nevada, which is mostly made up of desert and is therefore a very dry, arid state overall with low amounts of rainfall. Vegas residents don't see a lot of rain, especially in October, with an average of just three rainy days in total during this month. The city will experience around 7mm of rain in total, which is identical to the previous month of September. The chances of rain in Las Vegas in October start off at around 8% at the beginning of the month and remain steady through to the end, only varying by one or two percentage points. As well as rain and temperatures, it's important to look at other weather factors like humidity and wind speed. The humidity in Las Vegas tends to be quite dry throughout the year, generally remaining below 50%, and October is in line with this. The average humidity in the city in October ranges from as low as 15% to as high as 49%, but can go higher from time to time. Wind speeds tend to be quite low in Vegas but can pick up to around 10m/s (fresh breeze) during some October days. The average wind speed is around 3m/s, which is akin to a light breeze. The city is known for getting a lot of sun and receives around 10 hours per day in October. There are plenty of reasons to visit Las Vegas in October. The temperatures are still warm enough for people to be able to enjoy walking along the Strip or visiting the nearby Grand Canyon National Park without feeling the need to wrap up in lots of layers of clothing. Other outdoor attractions in the city include some outdoor live shows at certain hotels and outdoor shopping areas. Some of the hotels also offer rides and rollercoasters that are thoroughly enjoyable in October. However, with the weather starting to get a little chillier, October is also a good month to spend some time indoors. Fortunately, many of Las Vegas’ biggest attractions are situated inside, like the various hotels and casinos. There are a lot of different gambling and gaming opportunities all around the city, as well as many live shows like comedy, music, magic, and more. Lots of indoor shopping areas can also be found, as well as museums and upscale restaurants.